In the driest whitest stretch of pain’s infinite desert, I lost my sanity and found this rose. When in Damascus, buy damask rose. This was my line of thought on my trip to Syria. I made my way along the spice alleys in El Hamidieyeh Souk in search of rosa damascena also known as rose otto. I found it at BioCham, an aromatherapy shop established in Syria with “French know-how”. The cost of a 5 mL bottle of rose essential oil cost 3000 SYP-approximately $60 CAD. This is a bargain as rose is one of the world’s most expensive oils. The process of obtaining the oil helps account for this. The harvesting of rose happens yearly around May/June and it lasts only a few weeks. To get the best yield, the flowers must be hand-picked early in the morning before the heat of the day and processed shortly thereafter. It takes 10, 000 Lbs. of flowers to make 1 Lb. of rose oil or to put it another way, 2000 petals to make 1 drop. The oil is extracted through either steam distillation or enfleurage. A method of extracting a flower’s oil by pressing the petals into a fatty substance. The oil becomes infused into this medium and then extracted. Avicenna, an Islamic physician from Persia in the 10th century, is credited with inventing the distillation process and he was the first person to distill rose. He wrote one of the world’s most important texts in medical history entitled The Canon of Medicine or Al Qanun fi’l-Tibb as it is called in Arabic. In it, Avicenna (actually his European name) discussed many principles still in use today. He wrote of the ‘vital force‘ (life energy known variantly as chi, ki, prana etc. in Far Eastern medicines), the four humours used in Greek and Roman medicine (phlegm, yellow bile, black bile and blood) and the botanical pharmacy. He also discussed hundreds of plant substances of which rose was one-dedicating an entire section to the healing properties of this oil. Rose is an ancient flower whose oil has been used for healing since medieval times. Damask Rose, one of the many types of rose, is thought to have originated as a hybrid of rosa phoenicia and rosa gallica. It is found throughout Asia Minor including Syria and the Near East. Some say it was the Crusaders who brought the flower to Europe while other sources credit the Turks for introducing it to Bulgaria in the 17th century. Most of the commercially produced essential oil today is from Bulgaria and Turkey. BioCham is now producing oil of rose for the first time in 100 years. In trying to budget my money wisely I opted to buy their damask rose hydrosol (rosewater) instead of rose oil. Damask rose hydrosol and essential oil have a number of therapeutic applications. The hydrosol can be used in the case of conjunctivitis. In general, rose hydrosol and oil can be used in a steam inhalation, in masks and as a compress. Damask Rose is considered a ‘feminine’ oil. It helps to regulate the menstrual cycle and PMS by balancing the hormones although it is contraindicated for use during pregnancy. It is an excellent oil for use on the skin, particularly mature, dry, sensitive skin as it helps retain moisture and reduce wrinkles. Mixing rose with frankincense and neroli is said to help reduce the appearance of scars and stretch marks. 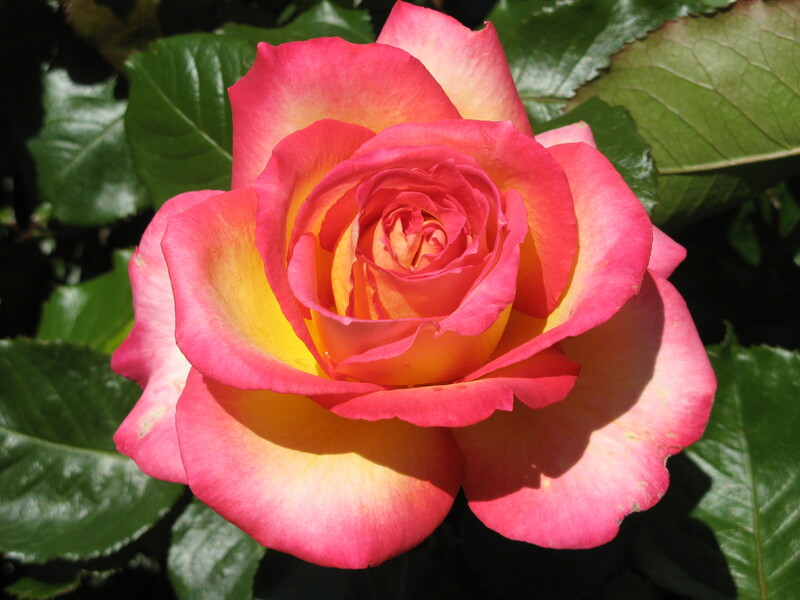 Rose is also a mild astringent and has antiseptic properties. With its tonic effect on capillaries and sluggish circulation it can be used to help deal with thread veins. These are just a few of the healing applications of rose. On a less physical note rose has a positive effect on depression, jealousy, resentment and grief. Its calming and soothing nature can ease nervous tension and stress. Rose oil is strongly associated with love and the heart. It is an aphrodisiac and ideal for balancing the heart chakra. The petals are often scattered at weddings. I’m sure rose has touched your life in some way. Perhaps you too have had a relationship with Damask Rose…? Sanskrit for wheel or vortex; an energy centre. The heart chakra is located in the centre of the chest and represents love of all kinds-for self and for others. A 30 mL bottle of rosewater goes a long way on the road. Spritz some on your face to help counter the effect of dry air on the plane. The added bonus is that rose is a bacteriacide (combats bacteria) and gives a pleasant aroma-ideal if you have a smelly neighbour with a cold. If traveling in a hot climate a spritz is a cooling astringent for your skin. When you’re feeling stressed on your travels, a soothing spritz will help alleviate this feeling. Catty, S. (2001). Hydrosols: The Next Aromatherapy. Rochester VT: Healing Arts Press. Lawless, J. (1997). The Complete Illustrated Guide to Aromatherapy:A Practical Approach to the Use of Essential Oils for Health and Well-Being. Dorset, Great Britain: Element Books Limited. Rich, V.A. (1998). Cursing the Basil: And Other Folklore of the Garden. Victoria, BC: Hordsal & Schubart Publishers Ltd.
Sellar, W. (1992). The Directory of Essential Oils. Essex, U.K.: The C.W. Daniel Company Limited. Wildwood, C. (1996). The Encyclopedia of Aromatherapy. Rochester, VT: Healing Arts Press.